Trump holds Florida, Iowa, Michigan, Ohio, and Pennsylvania. He adds Maine, Minnesota, Nevada, and New Hampshire. Of the usually Red States that are sliding toward the Blue column — Arizona, Georgia, North Carolina, and Texas — he loses only Arizona. Bottom line, 318 electoral votes, and possibly even a majority of the fictitious “national” popular vote. I will now temper that prediction by pointing out (unnecessarily) that the GOP candidate (probably Trump) will have a higher hill to climb than the Democrat candidate. Here’s how the 2020 electoral vote looks to me, at the moment: solid Democrat, 235; solid Republican, 132; in play, 171. I am still confident that Trump (or his successor) can win in 2020 — the “Blue Wall” is a myth. But victory won’t come as easily as my earlier post implied. Adapted from the electoral map for 2016 at Dave Leip’s Atlas of U.S. Presidential Elections. Leip uses blue for Republican and red for Democrat. This entry was posted in Electoral Politics and tagged election 2020. Bookmark the permalink. Iowa just threw out three Republicans in U.S. House Reps. Iowa has four seats. The last remaining Iowa Republican congressman — Steve King, who represents the state’s most conservative district — just barely crawled across the finish line by three percentage points. Iowa is likely to go Dem in 2020. 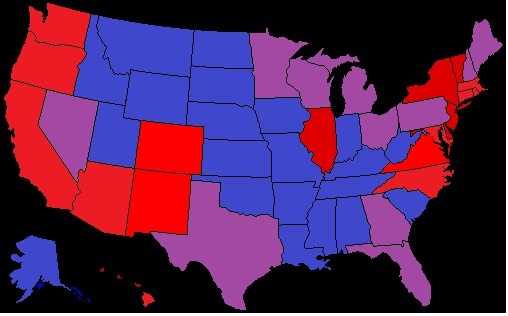 Now it’s only behind D.C. and Hawaii in Blue-ness (Blue for Democrat). I think it depends on how the “trade war” turns out for Iowa’s farmers. Trump took Iowa 55-45 in 2016. To lose Iowa after winning by that margin would be an unusual event, unless there truly is a Blue Wave in 2020. You’re right. Missed that the Iowa 2nd District was a Democrat hold. Brutal election for Republicans though.